As the evolutionary medicine project moves forward, it has become apparent that in order to understand what evolutionary medicine is and what effect it has, I need to understand whom people are working with, and what they are working on. My list (http://www.evolutionarymedicine.org/interested-people) of researchers with interests in evolutionary medicine contains 267 names. 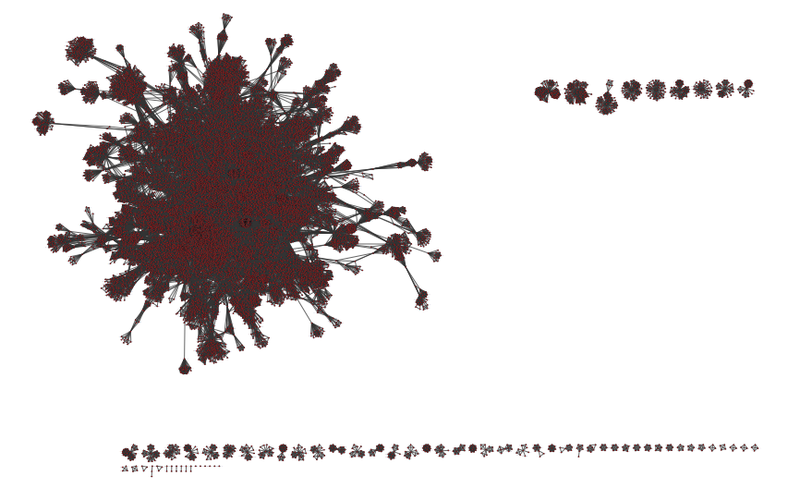 From that relatively small pool, I created a co-author network of 17,908 people containing 413,701 connections. In these networks, the most central nodes are those from the original list. One of the most interesting things about this network is that clusters of nodes and edges tend to condense around individuals who aren’t on the list. The history of science is littered with basic research that later reveals groundbreaking insight. Mendel simply wanted a better pea plant, after all. It is important not to limit my study only to individuals proclaiming an interest in evolutionary medicine, and extend it to research that might, also, be considered an evolutionary perspective on human health. When trying to make sense of this huge conglomeration of connections, it’s helpful to remember that each node is an author, and the edges between nodes represent the papers. Like the other networks I’ve posted, there are outliers. These represent people who don’t publish often, post a lot of sole-authored papers, or co-author within a very small subset of people. The largest network in the figure contains 94% of the authors and co-authors with 16,910 nodes and 98% of the papers with 409,412 edges. From this network, areas of research most active in evolutionary medicine begin to emerge. I am not satisfied that this network alone paints the definitive picture of evolutionary medicine’s impact on research. Certain areas of research, like clinical research on micro-RNAs, tend to have more authors than papers whose focus might be on an evolutionary perspective on clinical nursing practice. This lends itself to an inflated presence for certain areas of research in a co-author network. From this network, I can identify people that are involved with evolutionary medicine who aren’t on my original list of interested people by the density of the nodes. The density of the nodes correlates to the number of edges between the nodes. I can compare nodes based on their betweenness-centrality, a measure of the number of shortest paths from all vertices to all other vertices that pass through each particular node. Nodes with a high betweenness-centrality that are not already on my list of interested people will be included for later consideration because they are shown to have a high load due to their increased connectivity. This indicates certain individuals not on the list are working closely with multiple, separate groups of scientists that also have a connection to a person or people from the list. More papers must be collected for these new individuals. Once those papers are collected, I will build a network around the keywords in all the papers, and create a network between people and their keywords. The keywords of a research paper offer a glimpse into the topical material covered therein. Therefore, I expect to get a much clearer picture of the influence of evolutionary medicine than my original network of the individuals and their self-reported interests. I expect similarities between the two networks. The keyword network should illustrate the recent past and current state of influence of evolutionary medicine. While the self-reported interests network might also illustrate this, I expect there to be some future plans for research within this network that might result a false influence. After I’ve identified these specific areas of research most affected by an evolutionary perspective, I plan to select the papers from my corpus that fall within those areas and annotate the major topics contained within. Then, I will gather other papers in the same area of research, but that do not claim to operate within an evolutionary medicine framework. By creating and comparing networks of evolutionary medicine and traditional clinical research, I can illustrate the differences that come to light when we view human health through an evolutionary lens.